Farewell 2016, you strange old year, you little monkey. Putting the madness of Brexit, Trump and Celebrity Deaths to one side, there’s been a lot of change for me personally, changes that will see me taking a route yet to be determined, sometime around May in 2017. Meanwhile – here’s some 2016 photo memories, ahem, and of course they all have a theme linked to a wee drop of something. 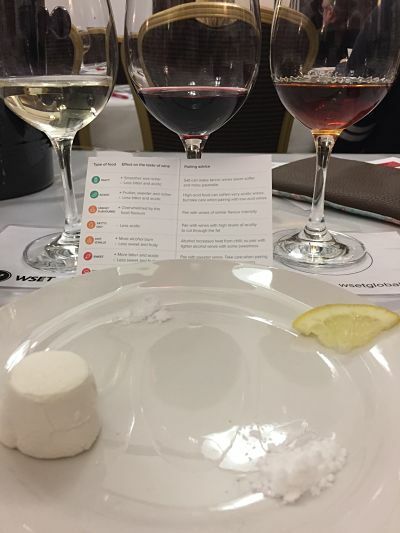 In 2016 I was determined to spend more time at press and trade tastings but they’re mostly in London. I live in Liverpool so inevitably travel, time and cost can be a problem. This year I set time aside in advance to head down to the Big Smoke (and get cheaper train tickets by booking early) !!!! 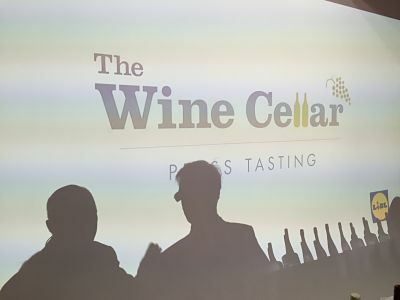 Here’s the first wine trip of the year to the capital – I loved the shadows both people and bottles cast on Lidl’s Wine Cellar branding. There’s a chap on Twitter I’ve followed for ages, Mike Turner, aka Please Bring Me My Wine who also wears a business hat 20h33. 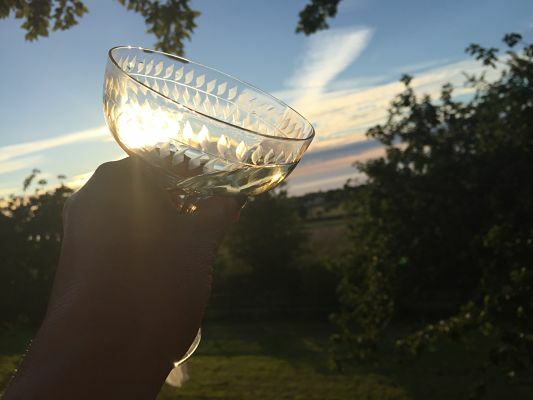 I’ve followed Mike’s progress with interest as he’s developed his wine business, built his social media profile and become a really interesting wine-talking chap to boot. 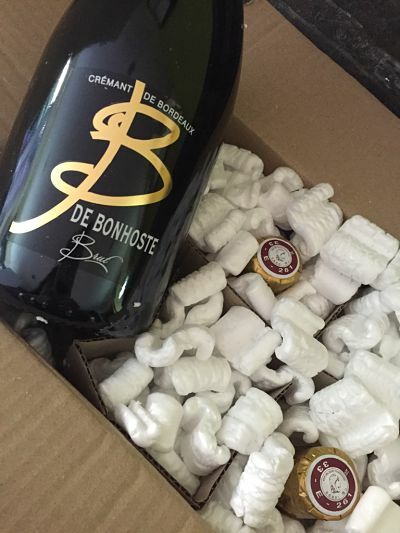 I ordered a case of crémant de Bordeaux from him as a Valentine’s treat for me and The Better Half. Very nice it was too. I met Mike at a London tasting a few weeks ago and hey, turns out he went to school about a mile from where I live. This world is a small one populated by Northerners. I love my doggie. Millie, the miniature schnauzer aka The Moo. I also love my wine; I think I’ve mentioned that. 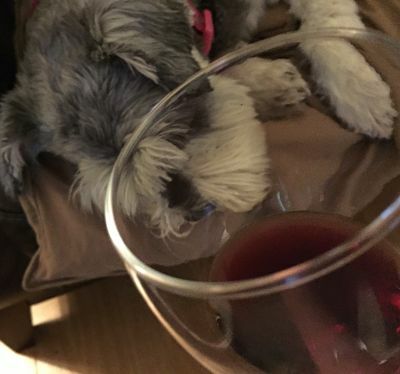 Here she is, the Moo, snoozing, as I took part in a Twitter taste test run by the Wine Society. She clearly didn’t get my excitement vibes. 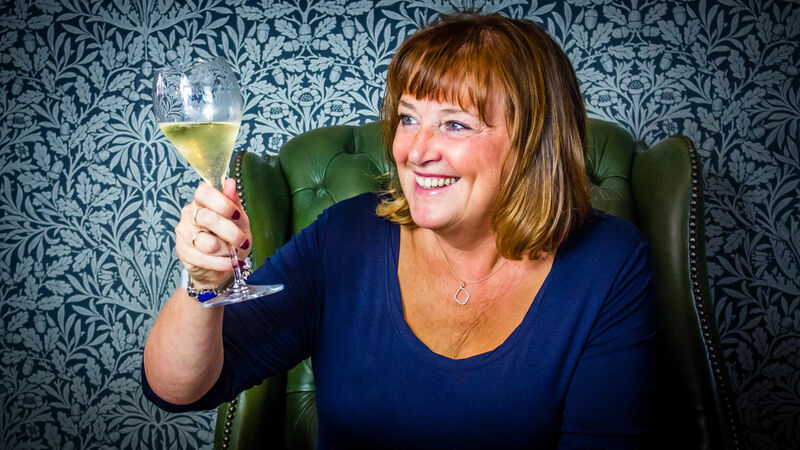 The Wine Society hosts a live tasting every month #TWSTaste with a couple of bottles of something nice. The Moo slept through it, as you can see. Not a great month on the job front, but hey yeh right. I’m moving on. I popped up to my pal Denise Mullen’s house on April 16 to meet her friends Ian and Sarah Hewitt. We didn’t half have a giggle, which was much needed as the day before I’d been made redundant from my Proper Job. 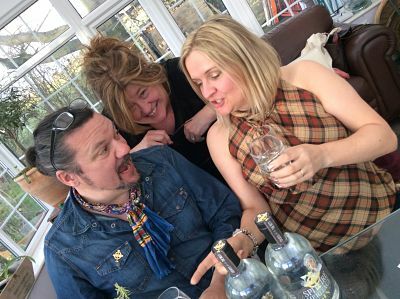 Ian, Sarah and Denise had created a new gin, Spitfire Heritage Gin which was about to be launched on the market. At Christmas 2015 the gin had been a Lightbulb Moment, a dream, an idea, a “can we do this” temptation. I’ll bring you forward to a couple of weeks ago to December 2016 and Spitfire Heritage Gin went on sale in Harrods. A terrific year for them. Another month, another tasting; two in fact. May is big in the London wine tasting calendar – but days off work, train fares and hotel costs could only stretch to a couple of days. Me and my mate Cambo opted for Asda and Waitrose on consecutive days and Cambo’s dad came along too. I nicknamed him Dadbo. I remember Dadbo streaked ahead of us tasting the wines, as me and Cambo did what we always do, overdose and linger by the sparkles. This Asti from Asda was one of Cambo’s favourites. We went to the pub. The World Cup was on and watching footie in the pub with a pint in my hand is one of my favourite past-times. I won’t linger on this theme too long in case anyone mentions Iceland (oops, I did it); but even though the England exit was a #facepalm moment, every credit to Wales, Ireland and Northern Ireland for giving me many pint-raising opportunities. I mentioned the redundancy thing, but don’t go fretting. I’m still working at the Mother Ship for now. In July that new role saw me in London back in my old office haunts and it was a grand opportunity to catch up with my London-living daughter Emma so we / she could hammer Mummy’s Purse. Which we did at Gaucho steakhouse restaurant on Canary Wharf. Emma’s pal had worked there once and after much text-toing-and-froing (and stalling the wine waiter) this was the Argentinian wine we opted for. 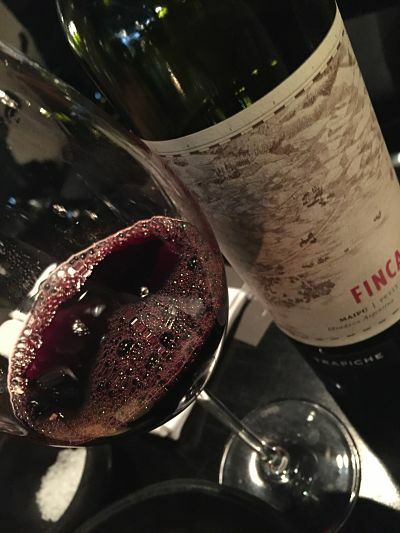 Trapiche Fincas 2010 Maipú, Mendoza, a petit verdot. I posted a piccie on Instagram describing the aroma of this wine (£49.50 !! eek !! ) as like pencil shavings. Well, OK, I’d been drinking. But not much, at Mummy Purse prices. My oldest friend (not OLD, please note that) has lived in New Zealand for many years and travels back to the UK every couple of years or so – and 2016 was one of those years. My daughter Emma is her god-daughter, so we both flew over from Liverpool to Douglas on the Isle of Man on a bumpy propeller plane, my fists white-clenched on the flight that lasts no longer than a gin and tonic (if only they served them). We had a lovely few days, with beautiful sunsets too. One night we popped the champers to celebrate our long friendship. I’m a bit of a sad wine geek and have loads of email alerts set up for wine, wine, wine, wine, wine, wine, wine. 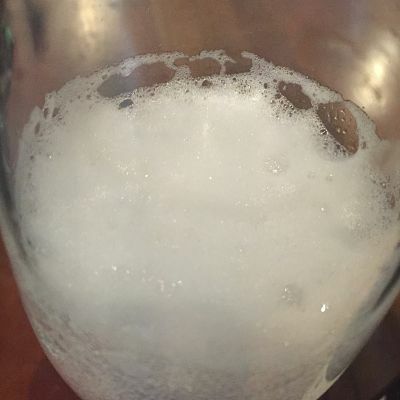 In the summer one wine almost broke the internet. La Moneda Reserva Malbec from Asda was declared the “best red wine” in a blind tasting by those clever people at Decanter. It was under a fiver. My wine alerts were groaning under this news so I kept a look-out on the La Moneda Malbec-shaped holes on Asda’s wine shelves. A few weeks later I was tipped off that the winning 2015 vintage was back in stock – High Five. I sipped a bottle with friends at my pal’s house and I also bought a bottle for my sister’s Christmas present. I drank that too. Sorry Sis. I mentioned I’ve been trying to get to more London press and trade wine tastings; but I’m well-placed to jump on a train to Manchester to the Co-operative’s HQ in Angel Square. I’ve been three times now to meet the marketing peeps and have a good one-to-one chat with their buyers. On days like that I appreciate how lucky I am; it’s not just about tasting wine, its also about learning from people who are working on the ground running in that lovely drinkable stuff. Ben Cahill enjoys his work. That’s him, peeping. Oh my, what a Christmas build-up. 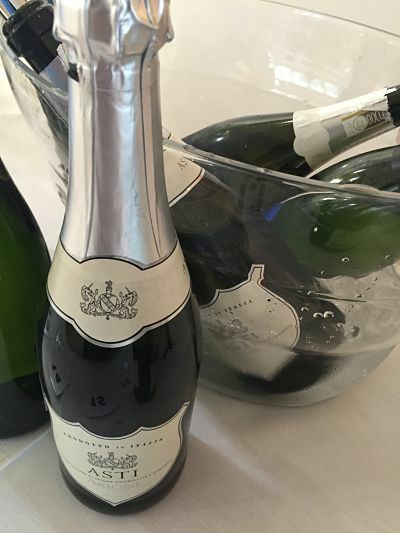 Fizz, Christmas and New Year wine choices, all to be found, tasted, recommended. 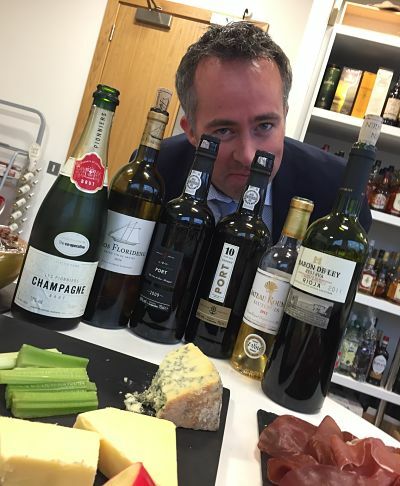 I buried my head in notes from the various tastings I’d been to in the autumn; Oddbins, Sainsbury, Majestic, the Co-op – then there were wines from Asda and some good choices from online merchants such as The Wine Society and WineTrust 100. My brain was drowning in wine. I ran a fun wine tasting with pals, during which we were totally unimpressed by Skinny Prosecco; and I also went with my pal Katie to one of the Wine Gang’s pre-Christmas wine events. It was there I had a reminder why I find wine so fascinating; we sipped some wines with little mouth sensations such as salt and lemon. It was so interesting how they changed the wine. It was right up my wine geek street. This isn’t so much a memory as a nod to the future. I have no idea what 2017 will hold for me but I’m beginning to think ahead, I have no choice as a mortgage has to be paid. 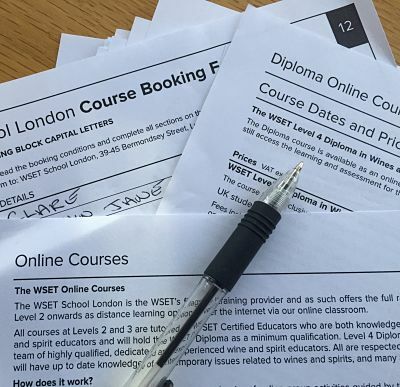 This month, December, I’ve made the leap and signed up to study my wine diploma in a spare time online capacity. I guess it will be like the Open University for two years but with alcohol. And as I write, Burnley FC have just beaten Sunderland 4-1. That’s great news for the end of this s****y year. Later I’ll be heading out with the Better Half to shake a fist at 2016 and after a meal we’ll head back home to quietly welcome in 2017 and its known knowns, its known unknowns, and unknown unknowns. I wish you all the best for 2017. Keep your nerve against Russian hackers, Trump, Brexit, and beyond. 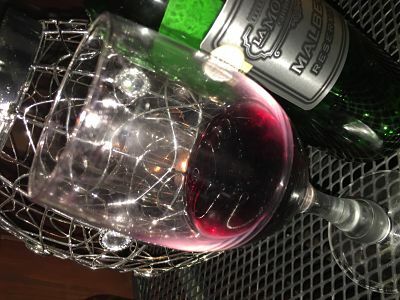 If all else fails, pour wine. About my Christmas bottle of wine Sis! Have a good New Year. Previous PostPrevious What links my new wine diploma diary and one of the cheesiest songs ever?